Would you like to learn how to make Vegan Chocolate Ganache? 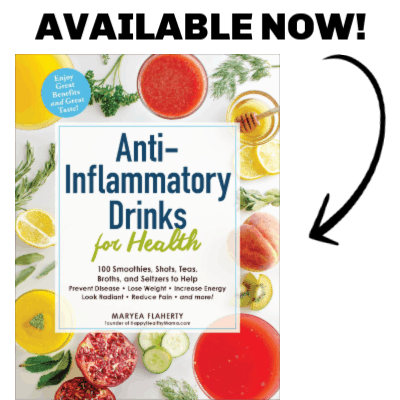 You just need two ingredients…let me show you the simple, step-by-step directions. 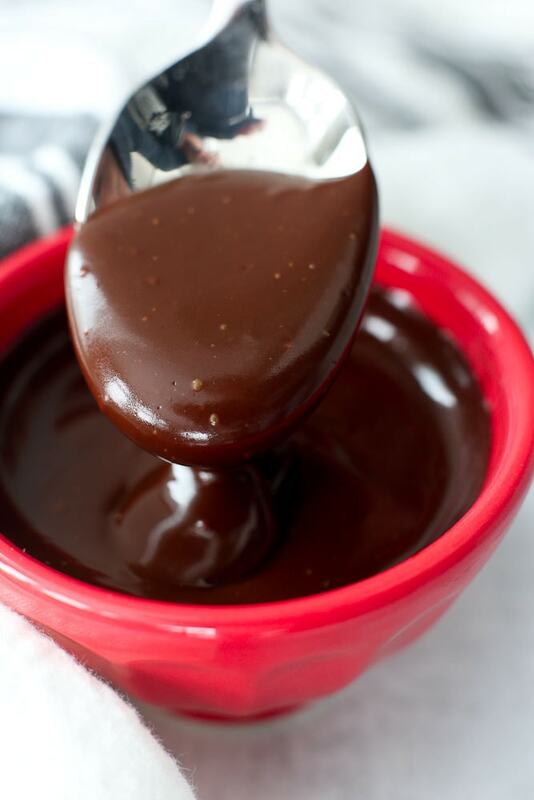 Ganache is easy to make and can be used in so many desserts. To make regular ganache, you only need two ingredients: dark chocolate and cream. Vegan ganache also only needs two ingredients and it’s a simple swap. 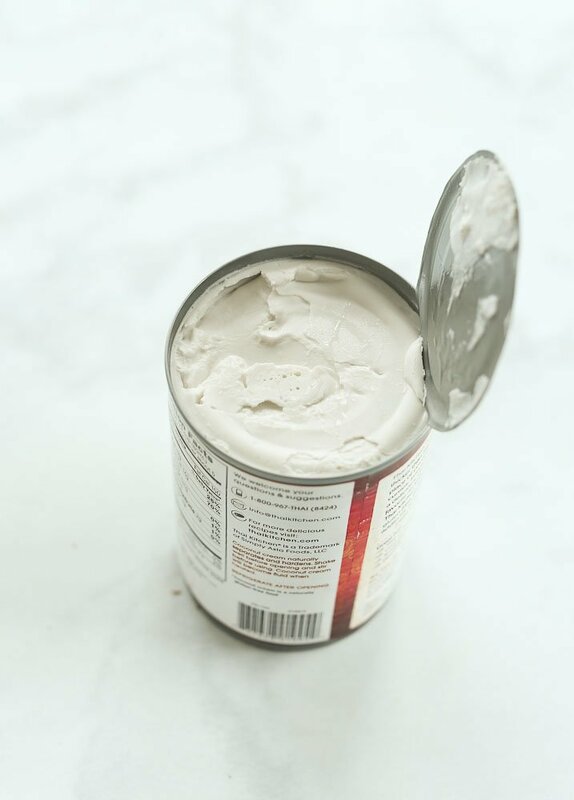 Instead of heavy cream, we use coconut cream. 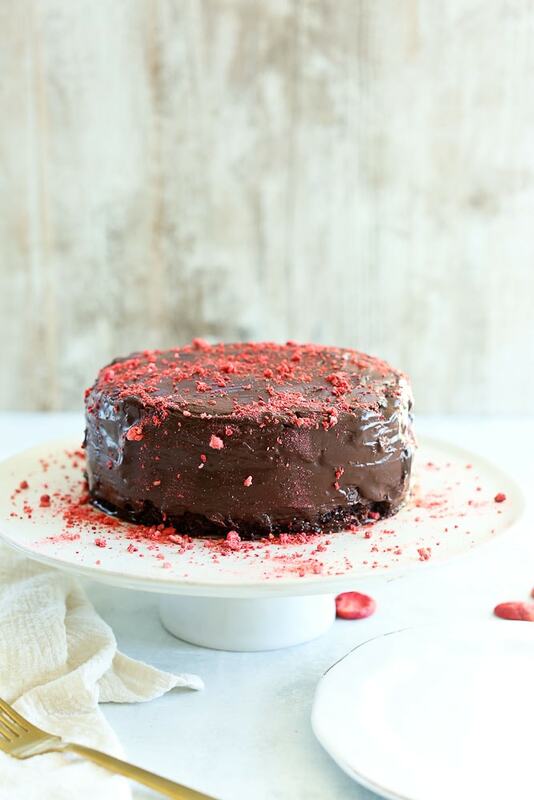 It works like a dream and gives you a dairy-free, vegan chocolate ganache that is simply wonderful. 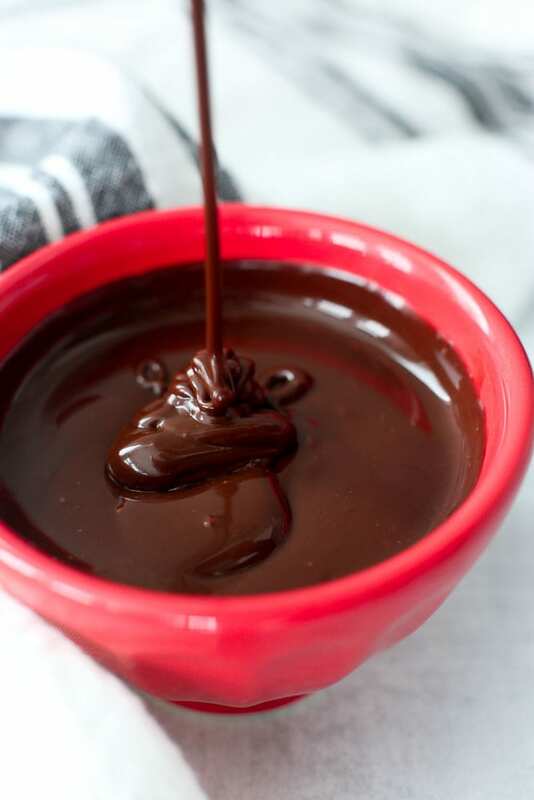 Chocolate ganache is usually made using a 1:1 ratio of dark chocolate to cream. I found using a ratio of slightly more chocolate worked better for this vegan chocolate ganache. 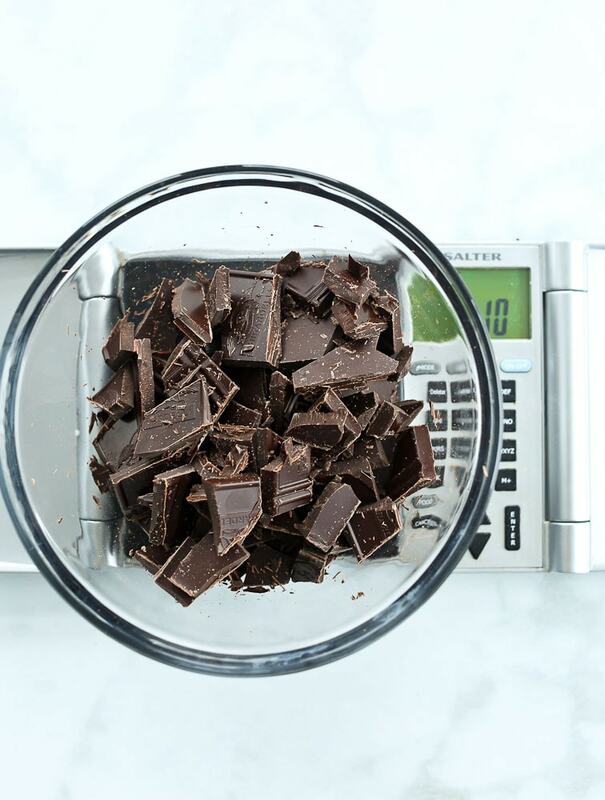 I use 10 ounces of chopped bittersweet chocolate and 8 ounces (1 cup) of coconut cream. Pro tip: Chop your chocolate finer than this picture shows. It still works when it’s this big, but after making it several times, the finer you chop the chocolate, the better this works. I also tested dark chocolate chips, and those work as well. This ratio allows the chocolate flavor to overwhelm the coconut flavor. I didn’t want the coconut flavor to take this over. It’s still there, but it’s more subtle. My husband Tim doesn’t love coconut flavor in his desserts, but he still really enjoyed this vegan chocolate ganache. Let me show you how easy it is to make this! Step 1: Heat your coconut cream on the stovetop. You don’t want it to come to a boil, but get hot enough that it’s just about to simmer. If it gets too hot, it will burn your chocolate, but if it’s not hot enough it won’t melt it properly. You should be able to put your finger in the coconut cream without it hurting. 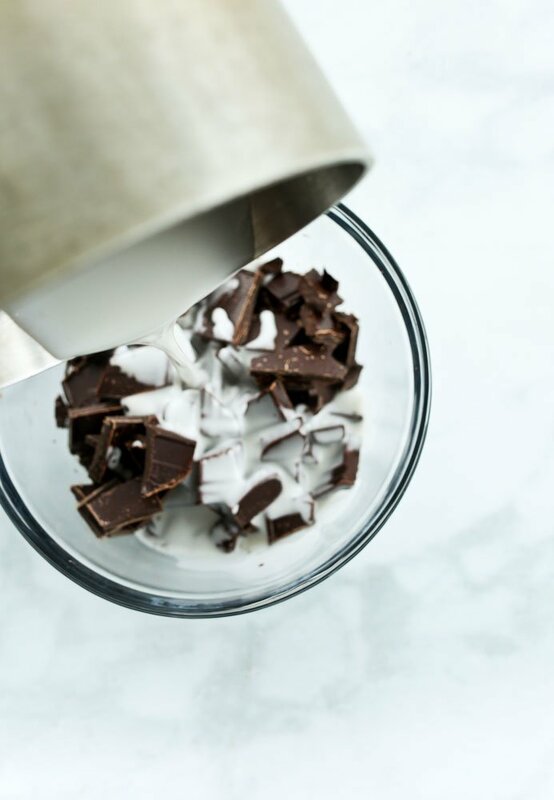 Step 2: Pour the coconut cream over the chopped chocolate or chocolate chips. Step 3: Allow the chocolate and coconut cream to sit for 2 minutes. Step 4: Stir the chocolate and coconut cream until smooth. Keep stirring, folding the chocolate and cream together. Eventually, the hot coconut cream will melt the chocolate. At this point, it’s perfect consistency for a pourable glaze. Or to just eat with a spoon. I won’t judge you. I’m not judgy at all. 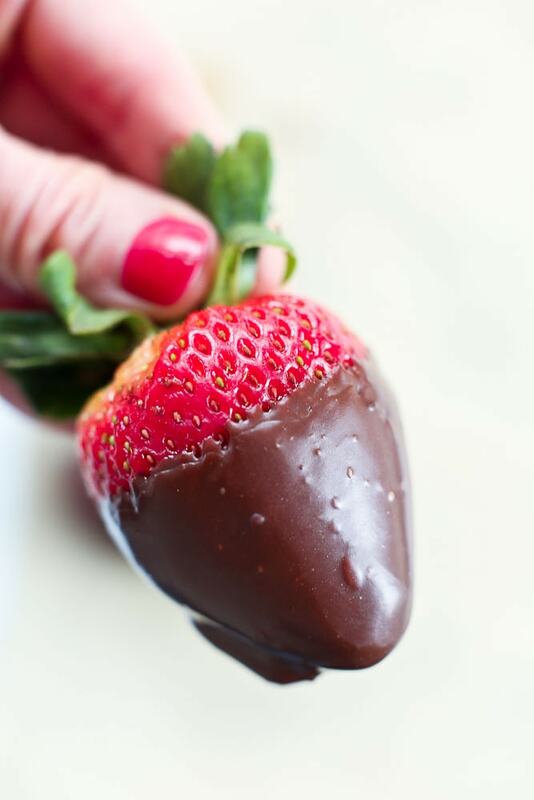 This consistency also works very well for chocolate covered strawberries. The Vegan Chocolate Ganache hardens nicely when cooled and is SO SO good. It’s not quite a hard shell that you might be accustomed to, but equally delicious. Make some for your love on Valentine’s Day! You can also use this Vegan Chocolate Ganache as a vegan frosting. Two ways to do this: let it stand at room temperature for at least and hour and then whip it with an electric mixer. For now, I’ll get to the printable recipe. Let me know if you try this! 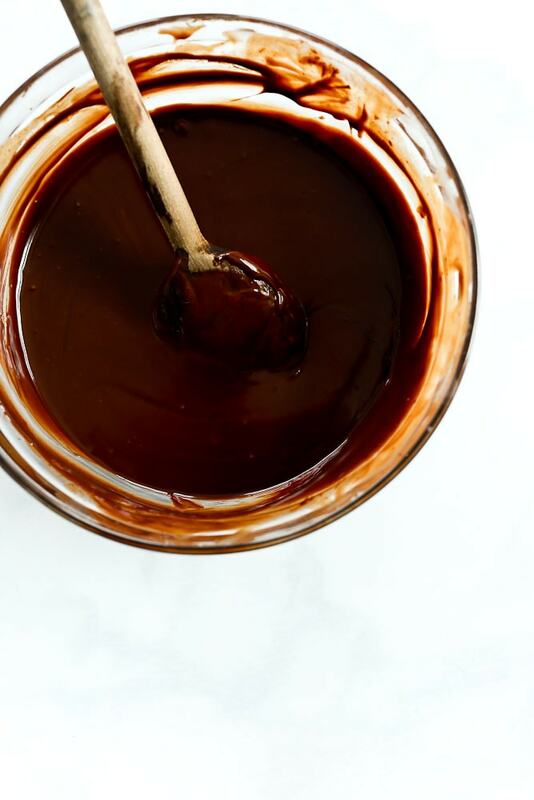 This Vegan Chocolate Ganache is simple to make with just two ingredients and you can use it in so many ways! 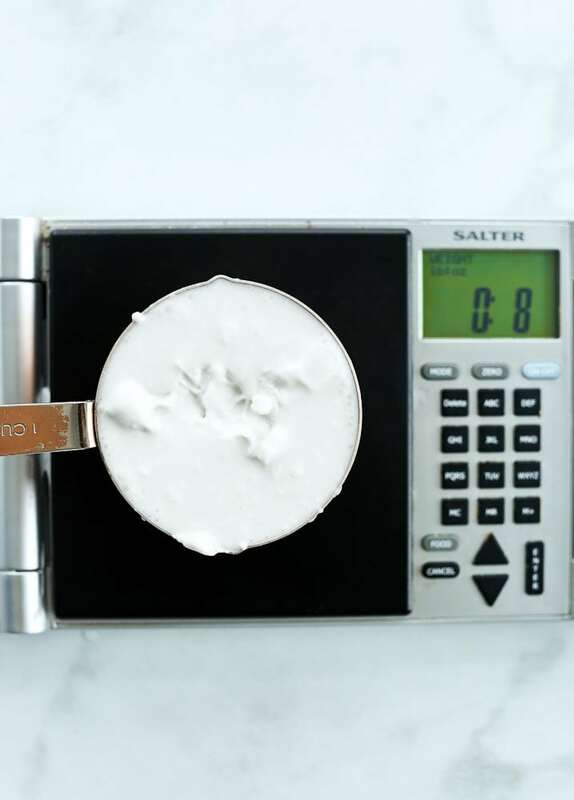 Heat your coconut cream in a small saucepan over medium low heat. You don’t want it to come to a boil, but get hot enough that it’s just about to simmer. If it gets too hot, it will burn your chocolate, but if it’s not hot enough it won’t melt it properly. You should be able to put your finger in the coconut cream without it hurting. 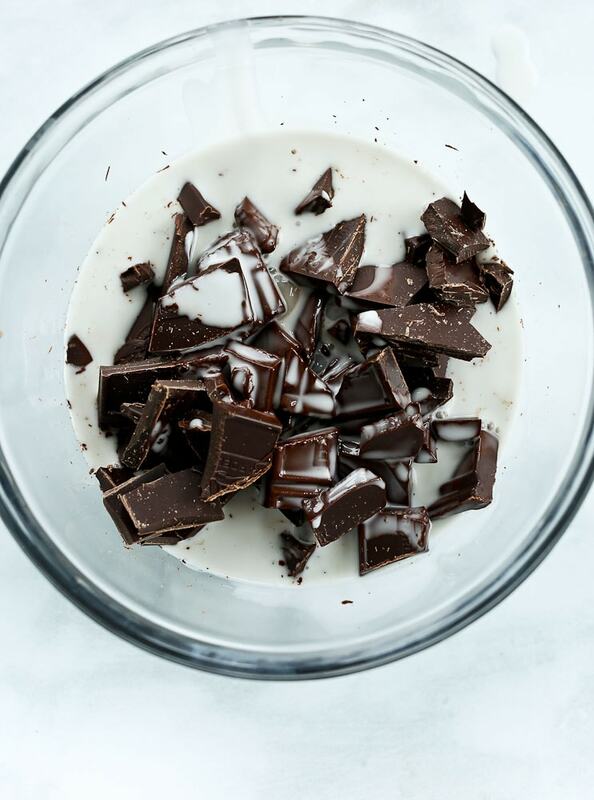 Pour the heated coconut cream over the finely chopped chocolate and let it sit for two minutes. 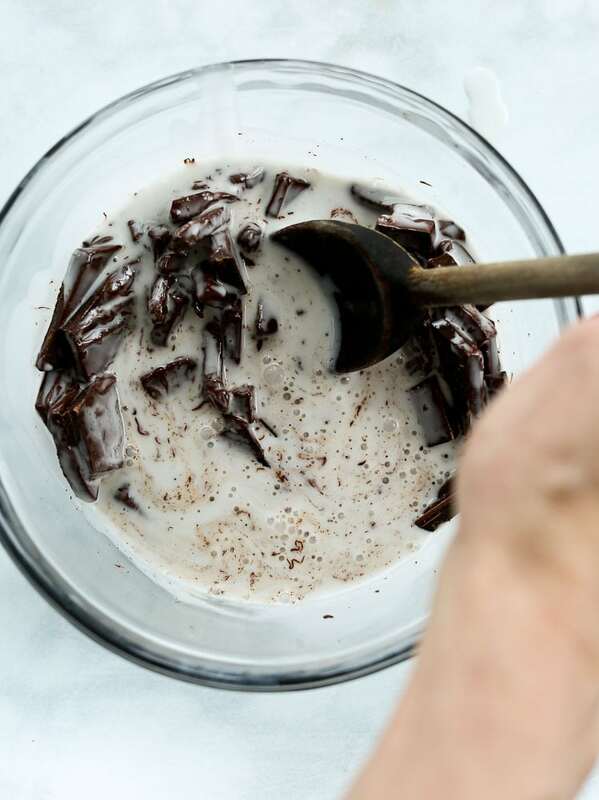 Stir the chocolate and coconut cream, folding them together. 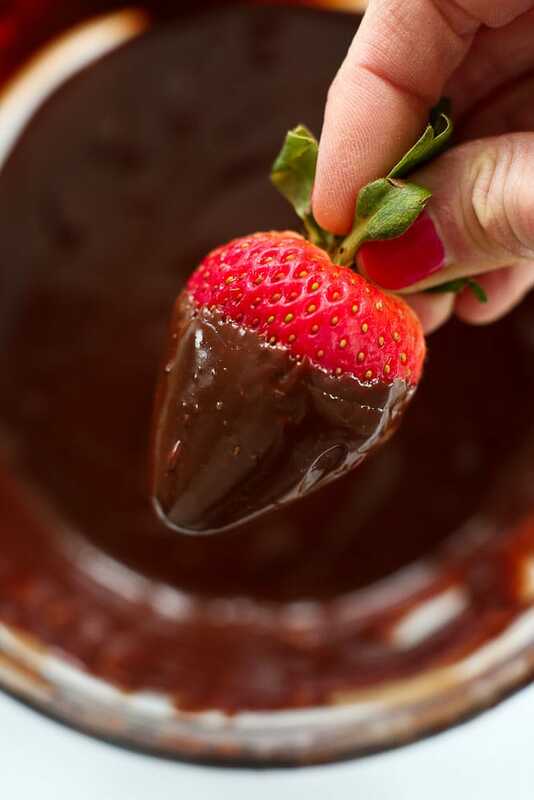 Keep stirring until the chocolate is melted. Use at this temperature for a pourable glaze or to dip fruit. Allow to cool to use as a vegan frosting. *If your ganache gets too hard at any point, you can always gently reheat it to soften. 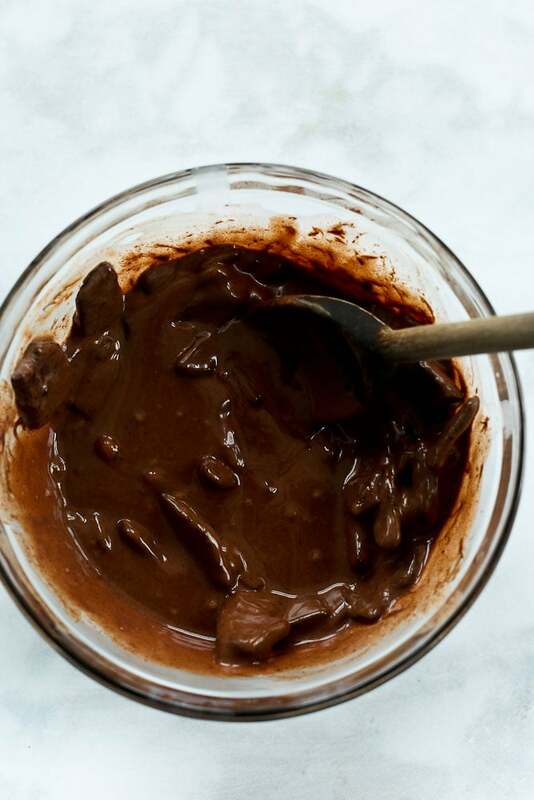 If you make this Vegan Chocolate Ganache recipe, or any Happy Healthy Mama recipe, I would LOVE to see it! Please take a pic and share it on Instagram or the Happy Healthy Mama Facebook page and tag me @happyhealthymama ? Very nice texture and very easy to make! I love how there are only 2 ingredients! Very yummy too! Thanks for your feedback Alaynah! Hey! Will this ganache have a coconutty flavor to it? Or does the chocolate overpower it? No, it doesn’t have a strong coconut flavor at all. Mostly chocolate! I want to try your recipe today, but I have a question first. Do you just use the thickened cream from coconut milk, or does that include the milk also. If just the cream, how many cans do I need. Thank you for your time.